Are you an Olympic caliber Performer? The Olympic Games in London are upon us and it makes for great theater. Competitors of all skill levels have one attribute in common – dedication. Each of them has devoted countless hours, tireless effort and made significant sacrifices to pursue their dream. Win or lose, they have accomplished a feat few people have – to compete at the highest level in their chose field. Now translate this same concept to your world. While the equivalent of the Olympic games may not exist in the same form, that shouldn’t deter any of us from being single purposed in achieving our potential. Throughout my career, I’ve observed my share of professionals who stopped short and chose to live life less than what was possible, and it was heartbreaking. On the other hand, I’ve also seen a number of people who recognize that dedication is the hallmark of those who perform at the highest level, regardless whether in a sport where you wear a jersey or serving in an organization. Dedication isn’t about obsession, though at times that can help, but is about activating a high level of self awareness and aggressively pursuing a plan of action to remedy deficiencies and accelerate strengths; the convergence of talent and choice. A powerful and practical workout plan is a must. You can’t just show up to the workplace, turn off your brain, offer another in a series of predictable responses to the same old questions and expect to make a difference. To pursue your potential requires a steady diet of learning, challenging your assumptions, living in the discomfort zone and loving it – the sweat, the contemplations, the pure joy of growing. Remember, growth and comfort can’t coexist so let’s continue our journey to get better all the time. 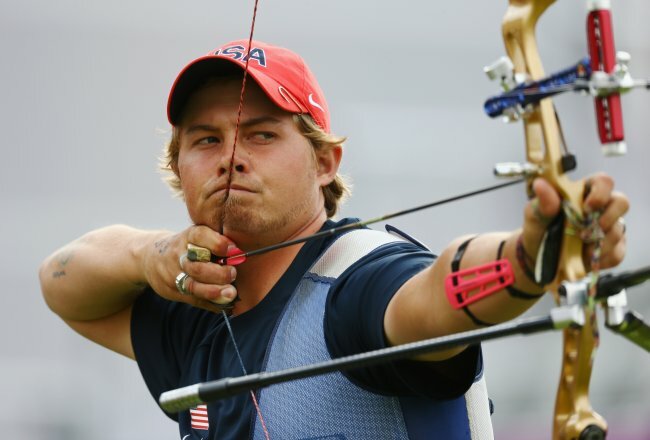 By the way the photo is of Brady Ellison, #1 ranked archer in the world and Olympic competitor, who hails from where I live – Glendale, Arizona. I just returned from a vacation in Southern California, enjoying the sights and sounds that it offers. Spent a few days at Pacific Beach in San Diego, trying to tame a wave or two on my boogie board. Yes, at 50 years old (I’ll be 51 in November) and I’m still out there with a bunch of young(er) kids trying to push ourselves to the limit and find out just how many times we can be tossed around before we realize we’re too old for the gig! I’ve gone boogie boarding for years and always enjoy the experience, it’s exhilarating. When you catch a wave and start to ride it, you feel so…I don’t know…alive. I’m not one who seeks out thrills per se, but pushing myself I’ve always found replenishing. I’ts healthy for us to occasionally live outside our comfort zone, feel the anxiety and keep moving forward. Too often in our lives, we want it predictable and routine, but that can numb us to the point where we don’t feel much at all. Whether you catch a wave at the beach, try a new restaurant, take a different way to or from work, we’re better for having the experience of feeling uncomfortable and realizing life is a verb not just a noun; life is for us to pursue and assert our mind, body and heart as we continue our journey to get better all the time. I finally had the opportunity to watch the premiere episode of “Newsroom” on HBO. The latest Aaron Sorkin tele-drama about a cable news network and the goings-on with the people who work there. It was a thought-provoking start and forced me to re-examine the role of the fourth estate (i.e. the media) in our society today. Sorkin is a hopeless idealist, which is okay, by the way, and he paints a picture with words his actors use, to emphasize their own sense of flawed nobility of the role he/she plays in our lives. News has changed, but not progressed, from fact-based to opinion-based and in the premiere episode, the desire is to return to the past with the powerful and simple phrase of “We Just Decided To Do It.” Now living in the past is one thing, but returning to the past is quite another. You work with people who wax nostalgically about the glamorous past of how things used to be as though problems today are more significant than previously. Baby Boomers, of which I am one, tend to do this quite a bit as they reminisce and unfortunately, it can hold back the natural order of things. Peer into your own crystal ball and forecast your own future – personal and professional. What do you see? An extrapolation of current trends or something quite different? Now look at your workplace – what’s the future look like? More of the same is not very compelling, is it? Now is the optimum time to be bold and remember those useful elements of the past that may have been discarded and seek to refresh them in today’s world. Public service is a noble profession and when you forget that, get out.